Men's Black & Silver Wedding Ring : LOVE2HAVE in the UK! 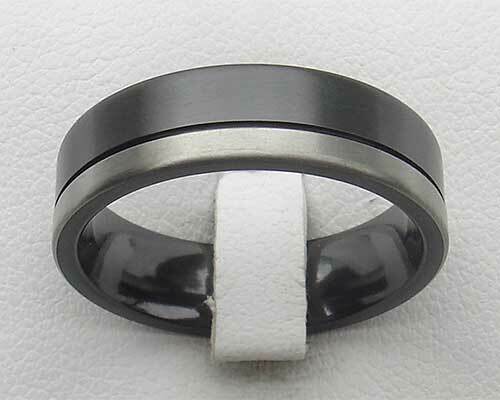 This particular men's wedding ring is a beautiful flat profile two tone wedding ring in black and silver. The silver stripe isn't silver but is in fact zirconium in its natural colour, and the black is also zirconium that has been heat-treated. The difference in contrast between the black and the silver tones are obvious to see, and this ring makes an excellent choice for a two-tone wedding ring with an alternative flavour, the primary advantage is that because it comes in zirconium, it is much cheaper than a gold wedding ring. The black and silver stripes are divided by a subtle groove adding to the fantastic designer quality. Pictured here is the polished silver and satin black version which we think looks the best. The standard width is 7mm, but other widths are also available too so please do email us for further details. These rings have a comfort fitting profile like all our titanium and zirconium rings so that they all feel very smooth when worn.